Son of George and Letitia Nash, of Witley, Surrey. Died 13-November-1918 aged 19 from an illness while serving on a P40 patrol boat. Albert’s mother lived in Ripley while he came to live with his aunt in Banstead. The Royal Nay casualties site records a note about Spanish influenza -The pandemic lasted from approximately July 1918 to April 1919 with a major peak in the UK between September 1918 and January 1919. It can be assumed that the vast majority of illness deaths in these periods were due to the Spanish flu. Deep brown spots would appear on a victim's cheeks and a thick, bloody fluid would begin to overwhelm his lungs. Starting at the ears, their faces would gradually turn blue as circulating blood could not get oxygenated. Soon, victims would start to drown in their own fluid — often coughing up a pinkish froth as they fought to inhale. "It is only a matter of a few hours then until death comes, and it is simply a struggle for air until they suffocate," an army doctor, wrote to a colleague in 1918. "It is horrible." The 1918 "Spanish" flu pandemic infected nearly half the world's population at the time. The virus killed more people than any other single outbreak of disease, surpassing the Black Death of the Middle Ages. It was called "Spanish" because the press in Spain, not being involved in the Great War, were the first to report on its impact. It is thought that the virus may have played a role in ending WWI as soldiers were too sick to fight, and by that stage more men died of flu than were killed by weapons. Grave Reference: E. 37. 17. HASLAR ROYAL NAVAL CEMETERY Hampshire, England. George was born on 27 December 1882 in Hackney, London, to George Nash and Elizabeth Rebecca, nee Cole; his family originated from Hertfordshire. The 1911 census shows George lodging with his uncle William and aunt Elizabeth (Nash), in Shrubland Road, Banstead. 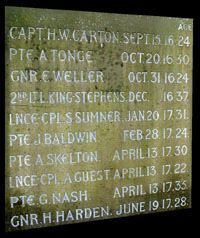 The All Saints record of Banstead Men who served overseas in WWI shows that George lived at No. 17. He was twenty-eight years old at the time and quite a few years older than his cousins, William, Herbert, Winifred and Dorothy. At that time George worked as a labourer. 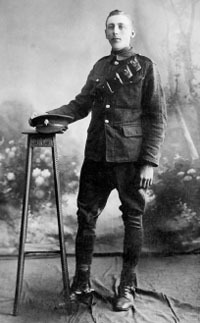 It is very likely that George was fatally wounded during or immediately after, the attack on Vimy Ridge. This was mainly led by the four Canadian divisions but the 95th Infantry Brigade led by Brigadier-General Lord Esme Charles Gordon-Lennox, included the 1st Battalion of the East Surrey Regiment in support. The Battle of Vimy Ridge formed part of part of the Battle of Arras, in the Nord-Pas-de-Calais region of France. The main combatants were the Canadian Corps against three divisions of the German Sixth Army. The battle was part of the opening phase of the British-led Battle of Arras, a diversionary attack for the French Nivelle Offensive, and took place from 9 April to 12 April 1917. The objective of the Canadian Corps was to take control of the German-held high ground along an escarpment at the northernmost end of the Arras Offensive. The Regimental War Diary for the 12th April 1917 records that there had been a heavy fall of snow early and the Companies put in some training in the morning. Orders were received advising that the Division would relieve the 4th Canadian Division on the left of the Corps front, and the 95th Infantry Brigade the Canadian 10th Infantry Brigade in the most Northern Sector; Relief to take place on the 13/14th . . . as it turned out, the order was cancelled and the Battalion moved on to Bois D'Alleux, Ccabaret Rouge. George died on the 13th so it is difficult to be certain what caused his death. The War Diary does report enemy snipers in the area shooting men on patrol, so this is another possibility. 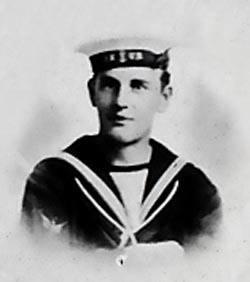 George and his cousin William (see below) were both Killed in Action but cousin Herbert, who served in Malta and Egypt, survived. All Saints Church Memorial Banstead, Surrey. Information from Phil Nash who researched George as part of his family tree. Died 27-May-1918 aged 21 in Aisne, France. William worked as a grocer's assistant at Geoff Pushman's shop in Banstead prior to joining the Army Service Corps as a driver. Willie is remembered in a book called Geoff's Banstead. We had a young man working for us in the shop called Willie Nash. I took to him at once, and he was very fond of me. Most fellows of his age wouldn't have wanted to be seen with a child, but he often wheeled me up the road in my pushchair. Willie used to sing the songs of the day while weighing up sugar, and taught me all the words. "Weigh up the yellow crystals this afternoon, Willie," I'd say,"and we'll sing." One day Willie came to work very excited. He'd bought a gramophone and asked if I'd come round to his house and see it. How thrilled we both were. When the war broke out in 1914, Willie was one of the first to volunteer. (Being only seventeen, he put his age on by twelve months). On leave he stood against the door as we scratched his height on it - so we could check whether he'd grown next time we saw him. He never came back." On the 27 May 1918, Private 61863 William John Nash would have been under the command of the Major-General D G M Campbell 21st Division, Brigadier-General G H Gater of the 62nd Brigade, and serving with the 12/13th Northumberland Fusiliers. That day was the first day of the Third Battle of the Aisne (river) which was a German offensive during World War I that focused on capturing the Chemin des Dames Ridge before the American Expeditionary Force could arrive in France. On the morning of 27 May 1918, the Germans began a bombardment of the Allied front lines with over 4,000 artillery pieces. The British suffered heavy losses, as they had been ordered to mass together in the front trenches which made them easy artillery targets. There was worse to come as the bombardment was followed by a poison gas drop. A short edited extract from 8th Division 1914 - 1918, by Lt.-Colonel J.H. Boraston & Bax graphically describes the events of the day that Private W Nash was killed. It was one o'clock in the morning of the 27th May, punctual to the predicted time, that the German bombardment was loosed. The whole of IX Corps front and many back areas - railheads, ammunition dumps and the like - were drenched with gas shell. Outpost lines were assailed in addition by trench mortars of every calibre, and the Battle Zone received the terrible bombardment from artillery of all natures. Our artillery positions were also violently attacked with gas shell and H.E. and had area shoots carried out upon them, with the result that by 6am most of our guns North of the river were out of action. A mist which rose into being with the opening of the bombardment, as though evoked at the will of the German Higher Command and in fact accentuated by the enemy's gas and smoke shells, grew steadily thicker as the night proceeded and made the task of defence additionally difficult. It was indeed, almost uncanny how in this spring of 1918 the luck of the weather favoured the Germans in attack. On each preceding night spent on the new front the weather had been clear and when, for the third time, the troops of the division found their defence hampered by a dense blanket of fog, men and officers began firmly to believe that the enemy had discovered means to put down a mist whenever it was wanted. Once the gas had lifted the main infantry assault by 17 German Sturmtruppen divisions commenced, led by Crown Prince Wilhelm, the eldest son of Kaiser Wilhelm II. Willie Nash is remembered on the Soissons Memorial, along with almost 4000 officers and men who died during the battles of the Aisne and the Marne. Memorial Reference: Names are listed on the memorial by Regiments in order of precedence, under the title of each Regiment by rank, and under each rank alphabetically. A book of poems by Cherrie Almond called "With Best Wishes". 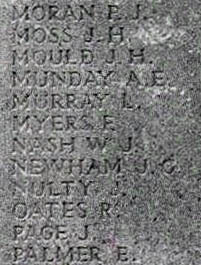 Section of the inscribed names on the Soissons Memorial which is shown below. Click on image to access the Soissons Memorial page on the CWGC site.